EUGENE, OR – Oakshire Brewing is set to release it’s first barrel-aged selection, Hellshire I. The first beer in the Hellshire series is an American Barleywine that checks in at 10% ABV. It was aged ten months in Heaven Hill Bourbon Barrels and will be released on Saturday, May 7th at 8 A.M.
Only 120 cases will be available for purchase and Brewmaster Matt Van Wyk believes half of that will sell at the release party. Van Wyk spoke to Brewbound about the new beer. Van Wyk said they have about 50 barrels on site at the brewery ranging from bourbon, wine and even gin which he plans to age a saison in. “We are hoping to work it up to a couple-hundred barrels, to where we could do quarterly releases of this Hellshire series,” he said. The entire press release, with details on Hellshire I, can be seen below. Oakshire Brewing produced roughly 3,000 barrels of beer last year and plans on increasing to 5,000 this year. Primarily distributed in Oregon, Oakshire Brewing is looking at regional expansion into the Seattle and San Francisco markets this year and eventually hopes produce up to 20,000 barrels per year. Though a majority of their offerings will be year round offering, Oakshire says barrel-aged selections will be an integral part of their business plan. 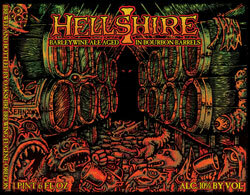 Oakshire Brewing to Release Hellshire I, Barleywine Ale aged in Bourbon Barrels on May 7th, 2011. Oakshire Brewing Company of Eugene, Oregon will release its first Barrel Aged Beer under the label Hellshire on Saturday May 7th. Sales of the beer begin at 8AM at the brewery. The first beer in the Hellshire series is a Barleywine that was 100% aged in Heaven Hill Bourbon Barrels for 10 months. Notes of vanilla, coconut, oak and bourbon intertwine with the beer’s complex malt and hop character, making for a contemplative beer meant for enjoying now, or aging for months or years. It is 10% alcohol by volume and sold in 22 ounce wax dipped bottles. Hellshire I: Barleywine Ale aged in Bourbon Barrels will be released at a special “Brunch” party at the brewery on Saturday May 7th at the end of the inaugural Eugene Beer Week. Complimentary coffee, live local music, and a local food cart serving breakfast sandwiches will be available from 8AM-noon. All of Oakshire’s beers will be sampled and pints, growlers, and kegs will be available for purchase. 22 ounce, wax dipped bottles of this special beer will sell for $15 and supplies are limited. Depending on the demand on Hellshire Day, there may be some available for Oakshire’s distribution partners around Oregon. Oakshire Brewing Company of Eugene, OR was founded in October 2006 by Native Oregonian brothers Jeff and Chris Althouse. With the goals of brewing the highest quality artisan beer and providing the highest level of service to their customers, Oakshire has become recognized for consistently brewing fresh, unique and delicious beers in relatively small batches. Visit Oakshire on web at http://oakbrew.com. They also offer brewery tours and beer tasting at their brewery every Saturday from 12-4pm. The brewery is located at 1055 Madera Street in Eugene. They can be reached at (541) 688-4555.